The aim of the kindergarten program is to develop the unique abilities of each child. Spiritual, intellectual, physical, and social-emotional growth is nurtured through the integration of school, family, and faith. In this self-contained environment, each child receives instruction in religion, math, language arts, science, and social studies. To learn more about our Kindergarten program please click here. The primary grades are self-contained. Religion, language arts, math, science and social studies are taught daily. Each year builds upon the previous year’s skills. The primary level learner is beginning a journey of faith. By participating in Mass, prayer services, community projects, and open dialogs with teachers, the primary student can focus on many basic concepts. Instilled in the primary learner are some basic concepts: Jesus is God; the Holy Spirit is God’s presence in each of us; God is a loving and forgiving Father; the Bible is God’s Word to us; God’s people, the Church; and care for one another. The primary learner acquires a growing awareness of God in his or her life. Beginning in first grade, language arts is taught through a basal system incorporating phonetic and English skills. These skills are further developed through personal journal and creative writing. Trade books are incorporated in the third grades to instill further a solid foundation for reading. Spelling is taught by the use of word families. Mathematics at the primary level provides the foundation upon which all learners build the critical thought competencies necessary in today’s world. A variety of strategies are used to meet the unique learning styles of our students. Each of these subjects allows the primary student hands-on experiences, lively discussions, and a risk-free environment for questioning. Physical, earth, and life sciences are introduced and expanded upon each subsequent year through the primary grades. Social studies explores the roles of families (grade 1), neighborhoods (grade 2), and global communities (grade 3). Weekly classes in art, computer technology, media, music, and physical education complement the primary experience. The intermediate level focuses on the beginning preparation for a smooth transition into middle school. Responsibility and development of faith are primary objectives of this level. Continuing the development of the journey of faith in daily religion classes, the fourth grade student explores the Beatitudes and the Ten Commandments while the fifth grade student focuses on the sacraments. 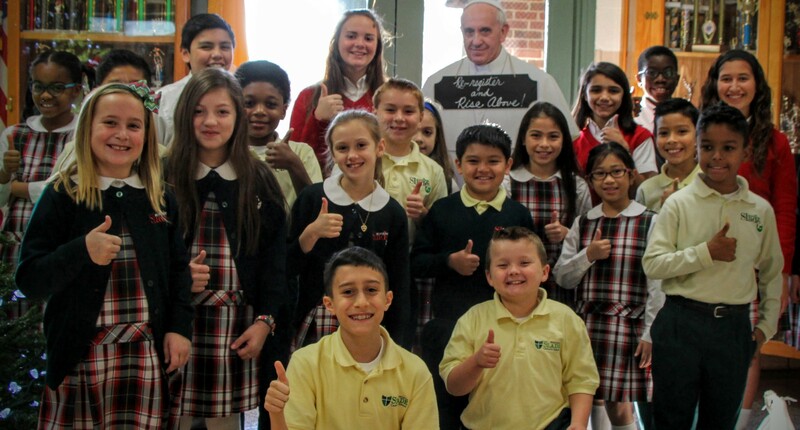 Students participate in Mass, prayer services, community service projects, and lively dialogues. An intensive study of the parts of speech is undertaken in the language arts curriculum. Mechanical skills are refined through daily writing drills and personal journals. Authentic literature and basal readers are used to reinforce reading skills. Vocabulary development is introduced through the study of prefixes, suffixes and roots. Emphasis is placed on the individual student becoming an independent reader through the use of novels. Building upon the skills taught in previous grades, higher level math competencies are taught. Fractions, decimals, geometry, and advanced problem solving skills are developed. Life, physical, and earth sciences are explored through hands-on activities and discussions. The social studies curriculum in the fourth grade focuses on world regions, Maryland, and the five themes of geography. The fifth grade concentrates on American History through the Civil War, westward expansion of the United States, the Industrial Revolution and American Government. Foreign language instruction continues in the intermediate grades. Students attend Spanish classes twice a week. Weekly participation in art, music, computer technology, physical education, and media enhance the academic curriculum at this level.